On The Orville Season 2 Episode 10, peace talks have a rocky start when an old friend of Malloy's turns up, accused of destroying Krill ships during the cease-fire. In the aftermath of the Kaylon attack, the Krill open the peace process and the Orville is sent in for the first phase. When they approach the Krill ship, the ship is firing on one of their own shuttles. They rescue the shuttle and Malloy recognizes the unconscious pilot as a friend who had been captured by the Krill twenty years ago, Orin Channing. Orin and his daughter, Layna, escaped from a Krill prison camp. Layna is non-verbal and traumatized, refusing to submit to a medical exam. The Krill demand the return of Orin, accusing him of destroying four Krill ships during the cease-fire. Orin shares with Malloy that he is against the peace. When the Planetary Union consider extraditing him to save the talks with the Krill, he tries to get Malloy to help him steal a shuttle. LaMarr notices some missing plasma containers and Keyali notices wounds on Layna's arms. Turns out she's not Layna and is actually an alien with volatile blood which Orin used to blow up the Krill ships. Malloy pretends to help Orin until he reveals his suicide plan. Malloy prevents Orin from attacking again but Orin blows himself up rather than give up on his vendetta. The peace talks proceed and succeed. Mercer and Malloy talk about how Orin wasn't the man who saved Malloy twenty years ago. That man died in the prison camp. 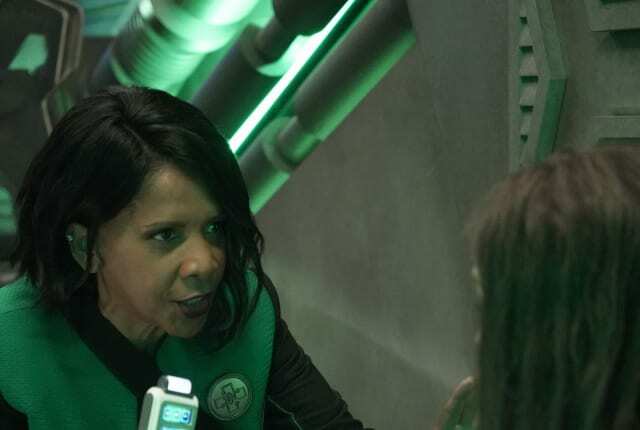 On The Orville Season 2 Episode 10, Captain Mercer must initiate peace talks with the Krill in the aftermath of fighting off the Kaylon fleet.